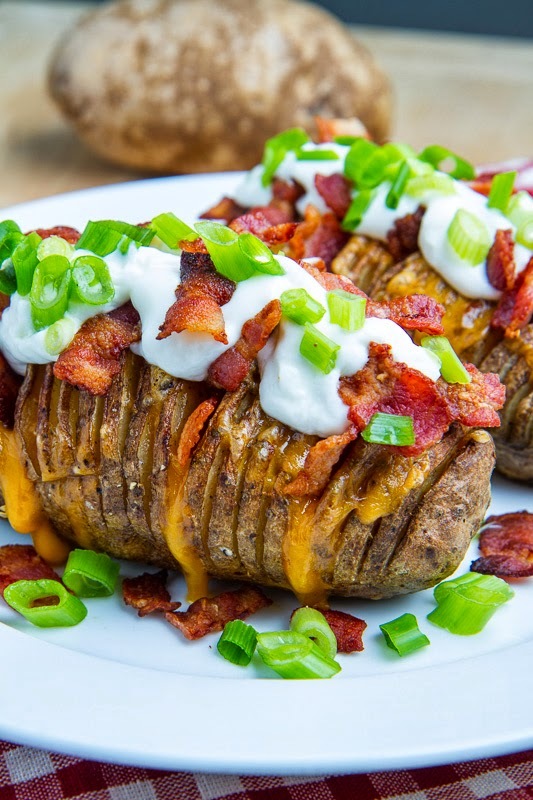 Hasselback potatoes, baked until crispy on the outside and tender on the inside and topped with all of the flavours of a fully loaded baked potato including melted cheese, bacon, sour cream and green onions. 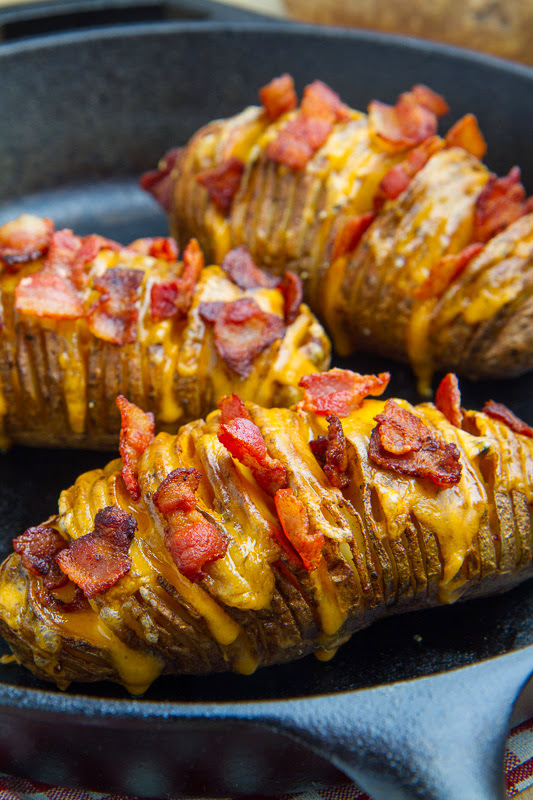 I have been seeing hasselback potatoes around for a while now and I have been wanting to try making them! 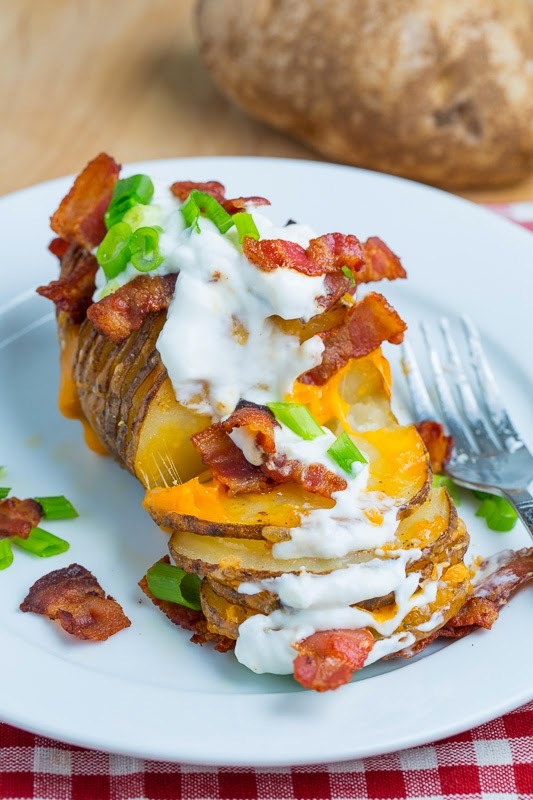 They are basically a potato that is sliced thinly and baked until the outside edges get nice and crispy, kind of like french fries, and the inside is nice and tender like a baked potato; the best of both worlds! In addition to being pretty amazing just like that, the space in between the slices are perfect for holding things like melted cheese. 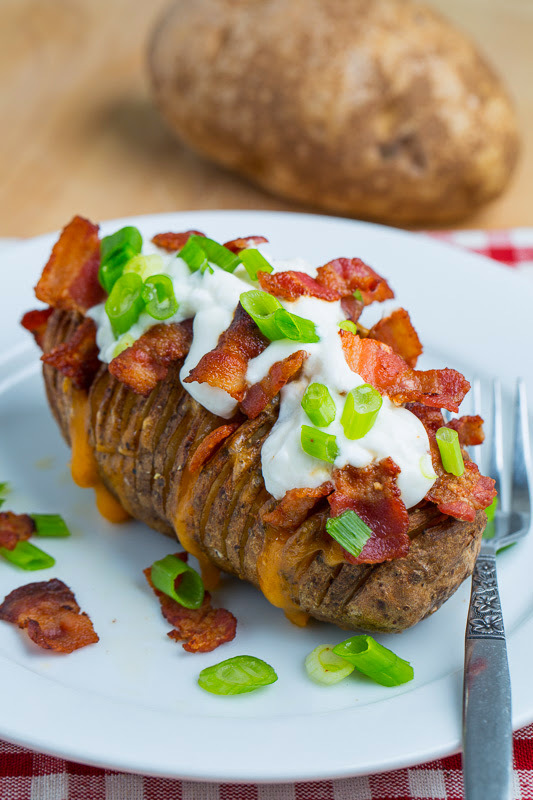 For my first hasselback potatoes I decided to go with a ‘loaded’ baked potato theme topping them with plenty melted cheese, bacon, sour cream and sliced green onions. Depending on the size of your potatoes these make for a side with small ones or even a meal with larger ones. 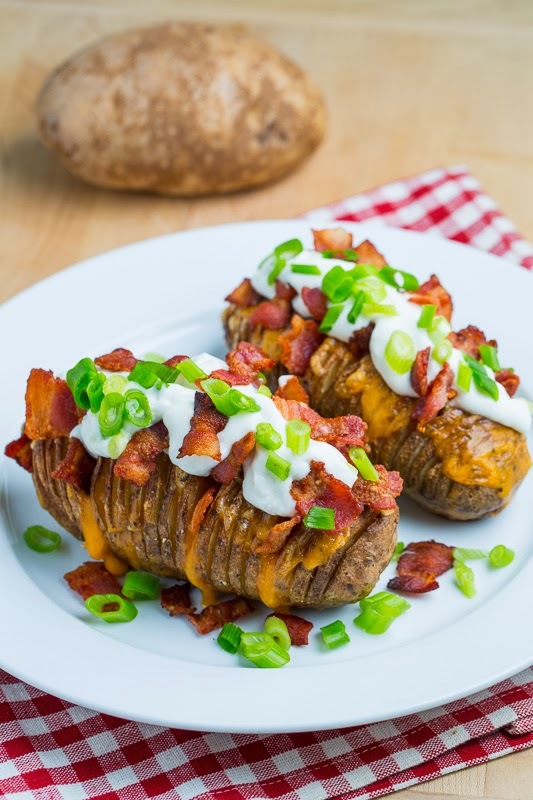 You really cannot go wrong with crispy tender potato, sour cream, melted cheese, bacon, sour cream and green onions! Ooey gooey melted cheesy goodness in between every slice of crispy tender potato! Roast in a preheated 400F/200C oven until crispy on the top and tender in the middle, about 1 hour. Tip: Place a wooden spoon or something similar at the base of the potato to help prevent cutting all the way through. I do not think those things could be any more awesome looking!! Wow! I make these once in a while when I need some comfort food – this version looks amazing! Gorgeous! 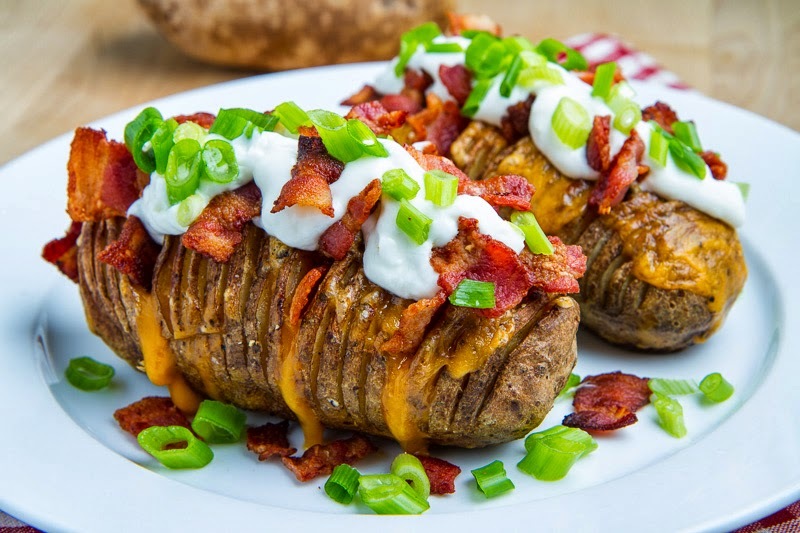 I love loaded baked potatoes. Hooooooly cow these looks amazing! I have been wanting to make hassleback potatoes too! These are killer! These are some amazing-looking potatoes! LOVE!! Fabulosa receta que estaré encantada de hacer. Me ha encantado tu blog que contiene deliciosas recetas y preciosas fotos. i like that you put sour cream twice, so do i! The slicing trick for these is to put the potato between two thin cutting boards or between 2 chopsticks. You can slice them up fast without any worry about cutting all the way through. Oh, great idea, must try this soon, maybee with goat cheese. Why have I never thought to fully load my hasselbacks! These look incredible! These potatoes are glorious! I could have them for game day or as dinner every night of the week! I love the green onions, and the idea of slicing the potatoes and cooking with garlic and everything in the oven (rather than heaping it all up on a baked potato). Wow, those look good. I've never seen these before, what a great idea. What a perfect Hassleback potato! Can't wait to try it! Ughh, I am so hungry now. I like hasselback potatoes (though they always seem to take much longer to cook than I think), and fully loaded makes them even better. Made these tonight. Probably won't make again. Ruins the whole point of a baked potato, which is scooping out the potato, filling the crispy skin with a week's calories worth of sour cream, and chomping on the whole thing. OK, so I made this right ? I am the cook and my wife wouldn't have it any other way, < nor would I > These are amazingly easy and to die for ! Just make sure you keep a close eye on them after you put the cheese on so it all doesn't melt down to the pan, Great food for guests too ! Su: The calorie count is per potato. I made these and they are delicious!!! After the potato is sliced, it's a goof idea to subject it to a good rinse to eliminate the starch from between the slices so they don't stick together.